When Leah returns to Alaska after years as a travel writer, she plans to make her log cabin a home. Christmas decorations fill every room. She spreads the holiday spirit by cooking for her neighbor. Having failed at romance in the past, she isn’t looking for love now. Merrying in Alaska is book 2.5 in the sweet and clean Alaska Dream Romance series. If you like charming holiday stories, adorable kittens, and happy endings, then you’ll love this novella in Shannon L. Brown’s heartwarming series. Includes two cookie recipes! 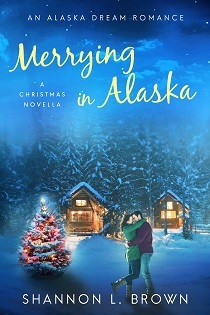 Buy Merrying in Alaska to bring Christmas joy today! A loud meow came from the floral-patterned cat carrier on the seat next to Leah Kinkaid. “We’re almost home, Cocoa. Life will be good soon.” Another, softer mew seemed to confirm that the tiny, black kitten acknowledged and agreed with her words. At least Leah hoped it was agreement. She and Cocoa had met a mere two hours earlier, so their love language had yet to be set. Her plans for the day had gone perfectly. She only needed to unload her suitcase, the human food, Cocoa’s food, cat box and other gear, then settle into home. New home. New hope. Those words flowed through her. Sure, she’d bought the log cabin north of Wasilla, Alaska, a couple of years ago and visited a few times—a total of eight days—but it had just been a stop in her travels around the globe. Today it was her world. Leah had come home to stay. She flipped on her right turn signal, slowly pressed the brake pedal, and the car successfully stopped without sliding on an icy patch. She hadn’t lost her Alaskan driving skills. Her glee turned to disappointment when she looked to her right. Thigh-deep snow, a blanket of white touched only by a few branches that must have fallen in a recent storm, stretched to her right, giving no indication that a gravel driveway hid beneath its depths. She pulled as far to the side on the road as she dared without getting stuck. It only served other houses in the area so it shouldn’t be too busy. “I’ll be done by eleven o’clock,” her snow plow operator had promised. Leah’s wrist watch read 1:15 p.m.
As Leah reached for the phone, hidden somewhere in the oversized purse that doubled as a carry-on, a slightly beat-up red pickup with a snow plow attached to the front came from the opposite direction. The driver waved as he turned in and began plowing her drive. Cocoa howled with all the intensity her little lungs could manage. “We’ll be inside soon. Our perfect Christmas is almost here. Don’t worry.” Her words didn’t change her kitten’s state of mind. A mother might rock a baby to quiet it. Trying to rock a frightened kitten seemed like a good way to get scratched on every exposed surface. Leah leaned down to peer through the mesh gate on the carrier. Cocoa paused, gave her new owner a stare, then let out another yowl. Cocoa broke into meowing again. Cocoa’s meow changed. If she didn’t think it would make her sound like a crazy cat lady, Leah would say Cocoa had begun to meow in tune with the song. The truck’s owner exited the drive and finished up by pushing the snow berm left by the road grader away from her mailbox. Then he waved once again, and drove away. Leah let out her breath in a whoosh when she pulled up first to her mailbox, removing the few items to arrive since she had turned off mail-forwarding to her mother’s home, then continued into the long driveway leading to her log cabin. When she passed the turn to the neighboring house and saw that stretch also plowed, she wondered if she’d paid for his driveway too. At her cabin, sun sparkled off icicles that clung to the edge of the cabin’s roof and dripped as the sun warmed them. Coming to a stop in the plowed parking area next to her front porch, Leah picked up Cocoa’s carrier with one hand and a bag of the kitten’s gear with the other. She unlocked the front door, entered her home, and placed the carrier down in the living room, something that silenced the kitten. Leah had fallen in love with this log cabin the first time she’d seen it. Something inside her had wanted a permanent home—not just the guest room at her mother’s or one of her brother’s homes. Sure, they’d always been welcoming. Keeping her suitcase nearby and ready for reloading wasn’t what she wanted anymore. Not that she’d spent much time in her cabin, but knowing it was here had made her smile many times as she’d slept in strange beds in countries around the world. Having a single bedroom, a kitchen with modern appliances and granite countertops, and a bathroom with fresh tile and fixtures sealed the deal. The living room’s focal point of a red woodstove had added extra appeal. She had bought a new couch in neutral tan and a new queen-sized bed. A couple of oak end tables and a chair in a cheerful print of yellow and turquoise completed the living room; a wooden table that could seat four in the dining room made it a home. She’d been content and happy to live with it, but now she had time to add special touches to make this a perfect home. After setting the heat to a tolerable temperature far above the current one that barely prevented frozen pipes, she did a spin in place. This time she wouldn’t come and go in a matter of days with only a suitcase in hand. After several more runs to the car, she’d brought in the rest of her worldly goods including what she’d come to think of as her Christmas kit which included boxes of ornaments and decorations she’d collected at day-after-Christmas sales over the years. Once she’d taken care of the kitten’s future food and litter box needs, Leah opened the carrier’s door. Cocoa peered through it, took tentative steps out and sat down. The kitten stared at her. Leah worked on dinner from the end of the kitchen counter, the one part of it where she could see into the living room. Boneless chicken breasts, a little chicken broth and seasonings, carrots and potatoes went into the slow cooker. After washing her hands, Leah slowly stepped to within a few feet of the scared, new addition to her family and sat on the floor. “You enjoyed climbing on my lap at the shelter. Would you like that now?” Leah held out her finger for the kitten to sniff. Then Cocoa came over to her and put her front paws on Leah’s legs. Leah picked her up in the palm of her hand and brought her to her chest. The kitten sighed and snuggled closer. As Leah gently petted her, the kitten began to purr.